The IVB 5 and IVB 7 M/H is equipped with the XtremeClean system which clean your filter automatically while you work. With IVB 7 you also get features like 70 l stainless steel container, robust steel frame and tilt or lift-off container emptying. 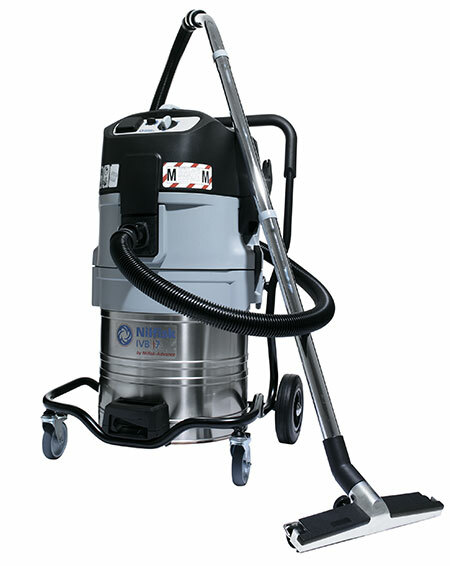 IVB 5 and IVB 7 M/H is the solution for the even more demanding customers with a higher frequency of cleaning. IVB 5/7 will solve all major tasks in your company - workshop, garage, production etc. Additionally this health & safety variant complies with all current requirements of the new European standard. The IVB 5/7 series is equipped with the XtremeClean system which allows automatic cleaning of the filter cartridge while vacuuming on full suction performance. The XtremeClean technology blasts the dirt off the filter and the suction performance is always high. The M class version is equipped with washable M-Class PET Fleece filter element - Easy and economical maintenance.